Description: When random killings start happening around Centerville, Marvin (Marv) Henderson, Centerville’s retired large-animal vet, now cowboy coroner, begins to see links that point to a serial killer with an unknown motive. With his friend, an elderly lady named Annemarie Smith, being one of the victims, nothing will stop Marv in his efforts to bring her murderer to justice, even when his own life is danger. 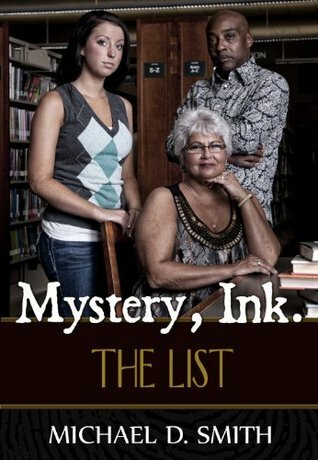 My Review: Mystery, Ink: The List is the second book that I've read in the Mystery, Ink series and they can be stand-alone. The other book I read, Mystery Heir, was great, too. I really liked the mystery. Marv, a former large animal vet, is now the coroner. He seems to enjoy it, yet when an elderly woman that he personally knows is murdered, he almost takes it personally and gets involved in the investigation. He is determined to find the link between the rash of murders, even though he puts himself and those he knows and loves in danger. What I found interesting, is that it's mentioned Centerville is a small town (around 40,000 people), yet the "town" I live in is about that same size and I don't consider it small. Maybe it's just the law enforcement side of it, but this really did have a small town feel it. I enjoyed the way the characters interacted with each other. Tom and Marv seemed to have a love/hate friendship, especially when Tom kept trying to discourage Marv from continuing his investigation. I liked how real Marv seemed to be. He took full responsibility for his strained relationship with his daughter and ex-wife, yet he did try hard to make sure they were protected. He was down to earth, yet curious and brave. I loved how I was guessing who-dun-it through most of the book. Content: some swearing; some violence (not graphic)--it is a murder mystery, after all; no romance.